I don't think there has ever before been a time in my life that I appreciated food as much as I do now. I have simply made it a mission to conquer the art of cooking. When presented with the opportunity to do so my goal is to create the most beautiful entrée that radiates with both taste and design. You may ask, where does this new desire come from? My response is that after eating a year of village food my body appreciates taste more than ever. I want to clarify that village and Senegalese food, though resemble one another, are quite different. It is like saying BJ’s Pizza is the same as Papa John’s (sorry California comparison). The only difference is, when under the influence of your favorite alcoholic beverage, Papa John’s actually tastes decent. Village food, on the other hand, has become something I put into my body in order to function. I know I have mentioned this before but, to clarify, I live in the land of Pulaars. Pulaars are located around West Africa and are typically known as cow herders. 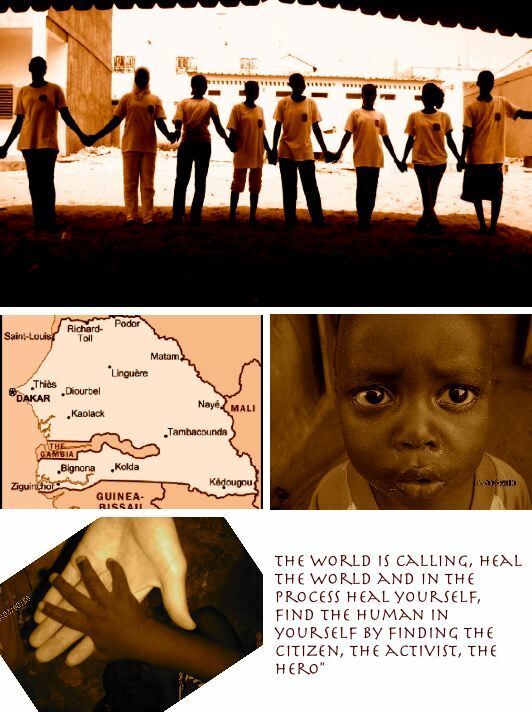 I live in an area where Fulakunda is spoken (a different dialect originated in southern Senegal). Thanks to the large number of cows that share my living space, dairy products tend to be a staple. My village also farms peanuts, corn, other types of grain, and rice. These are the essential staples to my diet. Fish is an occasionally luxury and chicken or red meat is a gift from Allah. Breakfast (kachatari)- There are a few choices for breakfast. They usually switch it up every day so you have something a little different. 1. Gossi is one of the most popular dishes. To be called Gossi it can have a minimum of boiled rice that imitates a thick porridge. In village, especially during the starving season, this is what is served. Often times they will add peanuts to it (crushed and grinded of course) and if they feel like splurging they will add sugar and sometimes Kosam (soured milk like a non flavored yogurt). In my household it usually contains peanuts and Kosam but most of the time it does not have sugar. I just have to say that I am not a big sugar person, but Gossi without it is a good remedy if you want to make yourself gag. 2. Mouni is another popular dish. It is prepared the day before by sifting a type of millet, adding water and forming tiny little balls. A rotational movement of the millet forms the tiny Mouni balls. The water and the right hand technique causes them to stick together. (It's a difficult process to explain and even harder to try). It then, like Gossi, is formed into porridge. Again depending on financial means Kosam and sugar are added to taste. 3. Kosam and millet This is usually consumed by adults in families that have more money. It is Kosam with sugar (like yummy yogurt) with hard millet added to it. The millet is not soft and ball shape like the mouni, but instead has a texture like a fine grain cereal. This is by far my favorite choice but is not often served. 4. Bread and Coffee- Thank the French for their baguette, which is a popular choice for those who live near a bakery. (cities and towns) They usually eat it with butter, mayo, or chocolate with this terrible coffee called Nescafe. Instant coffee that, ugh I cringe just thinking about it). I ate breakfast with my family in the begging but have currently discovered that by body now rejects it. Instead, I drink my imported Starbucks or Dunken doughnuts, with imported granola. Sorry I just can’t support the local cause in this matter. Lunch (Botarri) Lunch, if prepared well can be some of the most amazing food I have ever eaten. Again, most of this amazingness has been experienced outside of village. 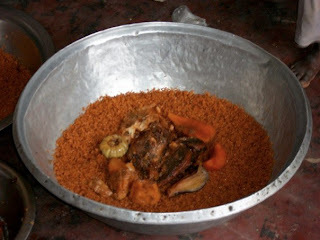 1.Cheb- is one of the most famous dishes in Senegal. There are two different types: Red and White Cheb. (my favorite is the red) White refers to white rice while red refers to rice that is cooked in tomato juice and oil. The best cheb is when rice is served in a large bowl (shared with everyone) with veggies (typically an eggplant, cabbage, carrot, turnip and bitter tomato) and fish. They are put in the middle of the dish where everyone will share by tearing off small pieces and eating it with the rice in front of them. The veggies are limited to what is in season and accessible at the time. Sometimes (really good cheb) will have Tamerain (a tree seed that is cooked and is delicious) accompanied by Follerae. (Boiled okra and leaves that are smashed and mixed together to make a sticky green substance. Also if cheb is really good, the fish will be stuffed with parsley, garlic, hot pepper mixture that is delightful. 2. Yassa (my favorite) can be made with goat, chicken, beef, fish, or have no meat at all. If there is meat it is marinated in oil, onion potato, & garlic sauce. It’s cooked and then served over rice. If there is no meat then just the sauce is served over rice. In village there is usually no meat so we eat sauce and rice. 3. Maffe Gerte- Is a peanut sauce that is cooked with oil and seasonings that is served over rice. The more money you have the more likely you are to have meat or vegetables with it. In village it is usually a peanut sauce, lightly seasoned. I used to like it, but it’s hard to eat it 5 days in a row. (yes this is what I typically eat for lunch. 4. Fish Balls- These are my favorite things to make. I find them so interesting, and if done correctly, absolutely delicious. After the bones have been removed, the fish is pounded into a thick texture with garlic, onion, sometimes parsley, salt, and pepper. You also add a little water and dry grinded peanuts to hold it together. They are then lightly fried and then added to either an onion sauce, or leaf sauce and served over rice. 5. Kodde or rice with Follerae- The worst meal ever! It is also one of the most commonly served in village. It is a thick type of millet or rice served with sticky green paste. The paste is good with cheb, but is not filling when served with just rice. They also will add a little red palm oil which is not very good. If you go to the market, this is what they typical lunch table looks like. Barbie eatingYassa with no meat! Dinner (Hirrande) There are two things eaten for dinner though it’s not un common to have gossi, when times are difficult. 1. Lacherie Jambo- Corn is pounded and then steamed which makes it similar to a quinoa type of texture. The sauce varies; sometimes it is a light watery peanut sauce, a thick leaf sauce, or if in the rare occasion your family is awesome a bean sauce. For the most part it is the watery peanut or leaf sauce. 2. Futonk – This is sticky white rice cooked with grinded peanuts and dried fish. It is salty and not bad tasting, but definitely not fulfilling. Red Cheb fancy style with meat!